As with most body parts, there are a plethora of movements you can utilize to target the desired muscle or group of muscles. 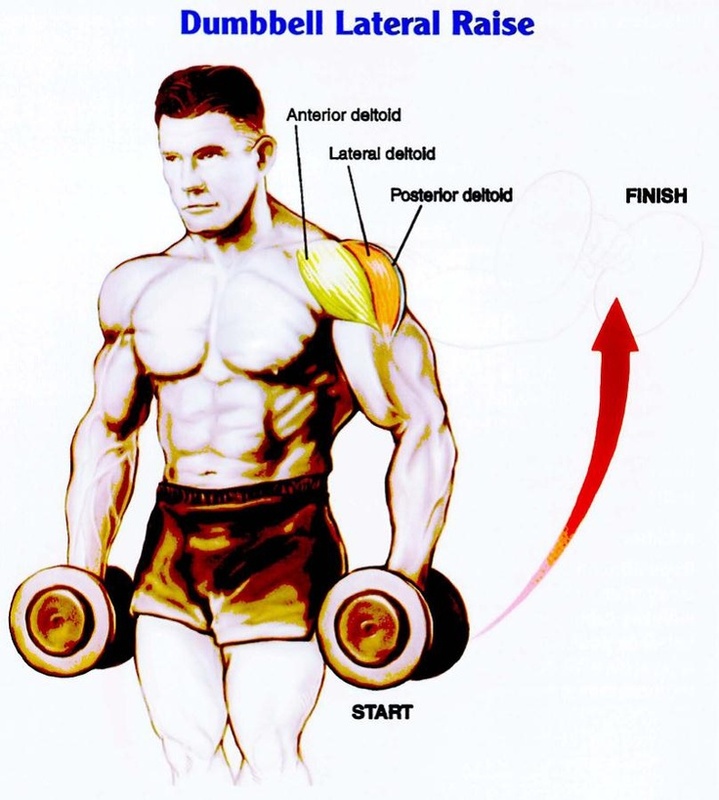 Although small the deltoid muscles can be worked from many angles with various movements to achieve varied results. Here are a number of effective exercises for this of muscle group. The Shoulder Press or Military Press is a staple delt exercise and can be executed from a seated or standing position. Sit or stand with back erect. Holding a bar shoulder width at neck level in front of you, press the bar straight overhead keeping back straight. Slowly lower bar to starting position. This exercise can also be done using dumb-bells. Stand with feet wider than shoulders. With a set of dumb-bells in hand, bend at the waist keeping back straight and shoulders slightly higher than hips. Allow arms to hang straight down with palms facing each other. With arm slightly bent at elbow begin to separate hands until arm are at your sides with palms facing floor. Squeeze shoulder blades together before slowly lowering hands with weights to starting position. With feet wider than shoulders, knees slightly bent and back straight, take a weight plate holding it with both hands (hold it with one hand at the 9 o’clock position and the other hand at the 3 o’clock position like a steering wheel). Moving the weight to eye level at the highest point and waist level at the lowest point, begin to make a big circle with the weight. As you lower weight to right side turn hip slightly to right . As weight passes waist begin lifting weight on left side as you turn hips slightly to the left . One complete revolution of the weight should resemble a big “O”. Continue making big “O’s” for desired numbers of repetitions. Repeat the movement in the opposite direction for desired numbers of repetitions. Make sure you use an appropriate weight (not too heavy). Standing, holding a dumbbell in each hand and elbows slightly bent. Raise both arms to the front simultaneously until parallel with floor, palms should be facing the floor. Lower to starting position and raise both arms to the side simultaneously until parallel with floor, palms should be facing the floor. Lower to starting position and repeat sequence for desired numbers of repetitions. To prevent injury when training the shoulders, it is important to use proper form and technique. The shoulder joint, similar to the hip joint in that they are both ball and socket joints, has the ability to move in all planes. It’s that same mobility that makes this joint less stable than other joints. However with good form and technique, you can develop strong and stable deltoid muscles.